Ryan Seacrest is arguably the busiest man in showbiz. (I honestly am not sure when he gets to sleep!) Along with that unequivocal work ethic comes a heart of gold. One of his latest projects includes the support of his family – and not from the sidelines. Along with his parents and sister, Ryan was able to launch his leading initiative with the Ryan Seacrest Foundation, with a series of broadcast media centers, called The Voice. His foundation, which is “dedicated to enhancing the quality of life for seriously ill and injured children through unique programs that utilize multimedia and interactive platforms to enlighten, entertain and educate,” will place these media centers in pediatric hospitals with the intention that it will contribute to boosting the esprit de corps among patients and caretakers alike. With so much on his plate, Ryan is no stranger to sharing his figurative meal with others. This initiative offers a new niche of opportunity for these children to feel loved and inspired while they recover, transition, and sometimes handle heavy responsibilities; all while being children. 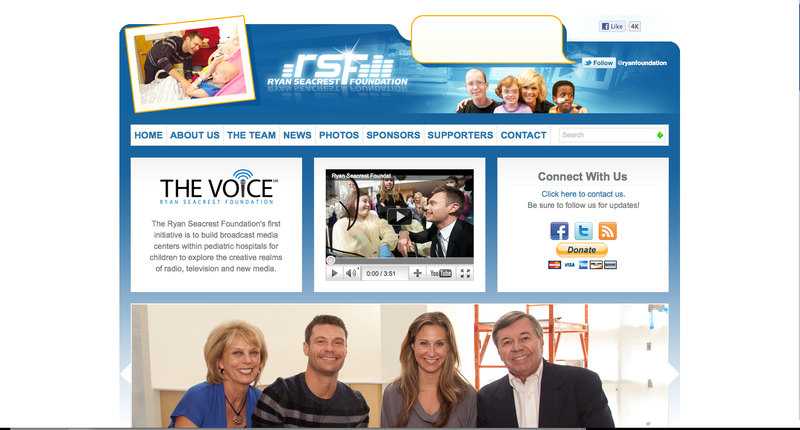 Now, thanks in part to Ryan’s foundation, they will also have a “voice”.